Research Services is made up of the Reference Librarians and Subject Librarians. 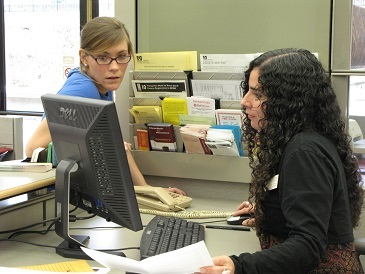 Each major, minor, and certificate program on campus is represented by a Librarian who you can meet with you to discuss materials, resources, and how you should be conducting your research. The reference desk is located at the Ask Us! Area on the Lower Level of the Du Bois Library or at the Service Desk on the 2nd floor of the Science and Engineering Library. Each has a reference provider on duty from 10am-5pm Monday through Friday. You can walk up to them with your questions or contact them online at this Link! 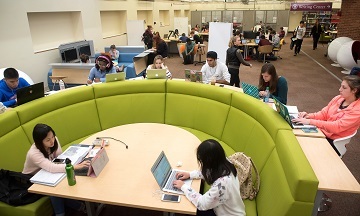 Undergraduate Teaching and Learning Services (UTLS) is the department in charge of the Learning Commons and Digital Media Lab Spaces. If you need help with hardware or software for classes or personal endeavors, stop by the desks on the 3rd Floor or Lower Level to speak with a member of student or professional staff about your problem. Also in UTLS is the Undergraduate Outreach Librarian, Annette M. Vadnais! Annette runs the Student Ambassador program for the Libraries, gives tours and information sessions, runs dorm and teaches classes, and can answer almost any question you could think to ask about the Libraries. The Ask Us Area is located on the north end of the courtyard on the Lower Level and is the department which takes care of all the borrowing and lending of physical materials in the Library. If you need to check out, renew, return, or request a book you can go to the Circ/Reserves desk. They also lend out Dell and Mac laptops, Mac chargers, camcorders, and mini projectors. Circ/Reserves also operates all Course Reserve loans. Course Reserves are materials left by professors for use by students in their classes here at the Library. Call numbers are specially assigned (so search using the Reserves tab on the front page of the website) and loan periods last three hours. There is *No Guarantee* that assigned materials for your course are available through Course Reserves, but be sure to check on the website or on your syllabus. The Learning Commons and Technical Support staff are in charge of the resources and space of the Learning Commons. Their students and staff can help you operate any of the hardware and most of the software available in the LC and also has UMass IT Staff that can help you with any minor computer problems and specifically helping to troubleshoot connectivity to Eduroam. Library Information, or the Info Desk, is located in the lobby on the South College side of the building. The desk is staffed by students and staffed the entire time the building is open and acts as the security force for the building. They are all trained to answer any question that you could ask, either directly, or by referring you to the person who can. Besides information, they roam the building every hour and check for security issues, lost items, and enforce quiet study on the designated floors. If you have a concern, stop by their desk and let them know about it. If you think you lost something in the building, check with the Info Desk first before searching around the building.